mCalendarView, which is our customizable calendar widget. 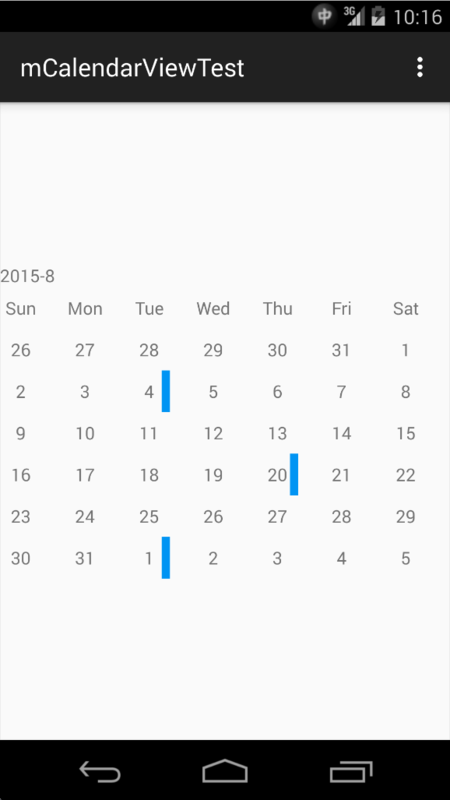 ExpCalendarView, which is expandable calendar widget. BaseCellView, an abstract view class for date cells. BaseMarkView, an abstract view class for marked / highlighted date cells. MarkStyle, provide built-in and default mark / highlight style values. 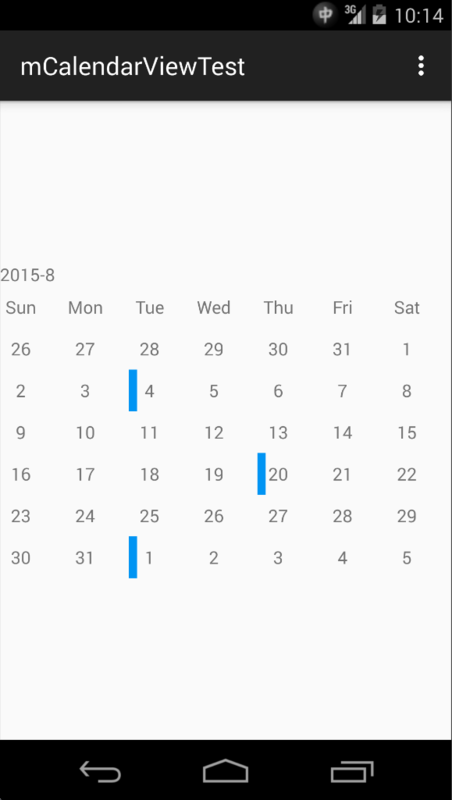 DefaultCellView, default view for date cells. DefaultMarkView, dafault view for mark / highlight cells. OnDateClickListener, which will be triggered when date cell is clicked. OnMonthChangeListener, which will be triggered when changing month by sliding left / right. After checkout this repo, you will get a sample project and the mCalendarView module is located in mcalendarview folder. Class mCalednarView is for normal calendar view. Class ExpCalendarView is for expandable calendar view. Expandable calendar view is contributed by my homie mBigMing. Big thank you for that. To use mCalendarView, you need to add it in layout by using xml file or Java code. Make sure you specifiy an FragmentActivity or it's sub-class as mCalendarView's context. By default, mCalendarView will display current month. If you what to jump to another month, use travelTo(DateData date) function in mCalendarView. Android's built-in widget dosen't have this feature, that's why I'm writing this widget. There are two method in mCalendarViewClass to highlight a date. To mark / highlight a date, use one of those two functions in mCalendarView. Below function will hightlight a date with default / global color and style. Below function will let you specify a customized hightlight style and color. mCalendarView provide below built-in mark styles. Mark styles are defined in class MarkStyle. Add a dot under date text. Add a colored vertical bar on the left side of date text. Add a colored vertical bar on the right side of date text. To specify the default / global highlight style, use setMarkedStyle(int style) function in mCalendarView. Default highlight style is change background color. To specify the default / global highlight style and color, use setMarkedStyle(int style, int color) function in mCalendarView. To specify a highlight style and color for one day, use setMarkStyle(MarkStyle markStyle) function in DateData. 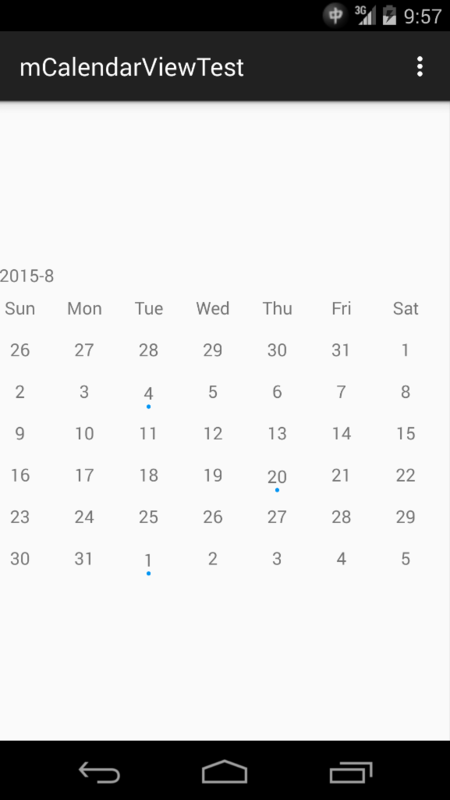 mCalendarView allows you using your own views for date cells, but there are some restrictions. Your customized view must extend BaseCellView, which inherit from LinearLayout. Your customized view must implement setDisplayText. This function will be called when mCalendarView need to display something in the cell. Usually it's date number or day of week ('Sun', 'Mon'...'Sat'). Create a layout xml in your project which root node is your customized view. For example, I created a layout_date_cell.xml in the sample project. Build your view and pass its id to mCalendarView by calling setDateCell(int dateCellResId). 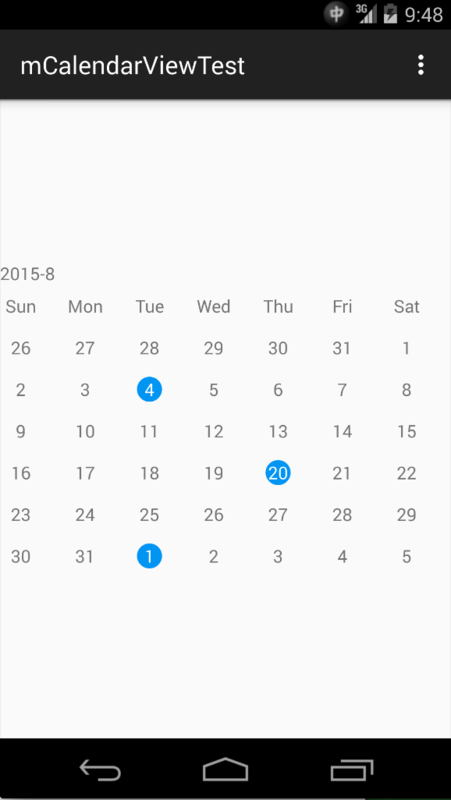 mCalendar allows you using your own views for marked / highlighted date cells. To use this feature, your view need to extend BaseMarkView. The rest parts are the same with Use Customized Date Cell. OnMonthChangeListener is an abstract class and will be invoked when user sliding right or left to change month. It will provide value of current year and month as parameter. To set an OnMonthChangeListener, extend this class and call setOnMonthChangeListener(OnMonthChangeListener l) function in mCalendarView. OnDateClickListener is an abstract class and will be invoked when use click on date cells. It will provide a DateData as parameter. To set an OnDateClickListener, extend this class and call setOnDateClickListener(OnDateClickListener l) function in mCalendarView. For WeekColumnView Translate in ExpCalendarView. See LICENSE file for details.